Russia intends to participate in the restoration of the Donetsk and Lugansk Regions together with Ukraine and hopes that other European nations will follow suit, State Duma speaker Sergey Naryshkin says. 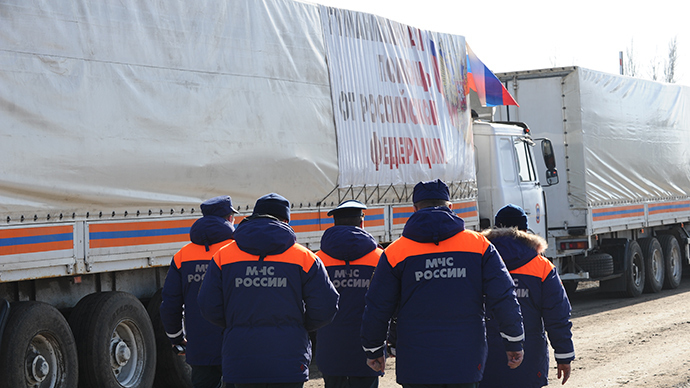 “We are already helping people in Donbass, first of all by sending humanitarian aid. I hold that Russia will not leave itself out and surely will help to restore this region. However, this will be a common task shared between Russia and Ukraine and I hope that our European partners will also participate,” RIA Novosti quoted Naryshkin as saying. He also suggested to use all resources of the OSCE Parliamentary assembly to back the efforts of the ‘Normandy Four’ – the leaders of Russia, Ukraine, Germany and France - who developed and approved the plan to end the military conflict in the self-proclaimed Donetsk and Lugansk Republics. Naryshkin told reporters that he asked the head of the State Duma Foreign Relations Committee Aleksey Pushkov to pay special attention to the OSCE’s capabilities in control over observation of all conditions of the Minsk peace plan. Pushkov will deliver a report before the OSCE’s Parliamentary Assembly at the opening of its winter session this week. The Duma speaker added that in his view the OSCE was on a more balanced position regarding Ukrainian crisis compared to the Parliamentary Assembly of the Council of Europe (PACE), with which Russia has severed relations for a year. However, Naryshkin noted that the inter-parliamentary workgroup on Ukrainian crisis created in PACE on Russia’s initiative, had not yet started its work, mostly due to the US delegation’s position. “Members of the State Duma understand that the dialogue with our Ukrainian colleagues would be very difficult, but there is no alternative to it and we must do everything to thwart any attempts from across the ocean to obstruct this dialogue,” he noted. Naryshkin also said that in his opinion the sponsors of anti-Russian sanctions must share the responsibility for human casualties in Ukraine that include many civilians. He reminded journalists that every new sanctions package worked as an impetus for the Kiev regime, causing more shelling of cities and towns in Donbass. “If the authors of this initiative are seeking to end the civil war, they must see that the result is directly opposite. I can say with confidence that the sponsors of anti-Russian sanctions are also responsible for thousands and thousands of deaths in Ukraine,” he said.